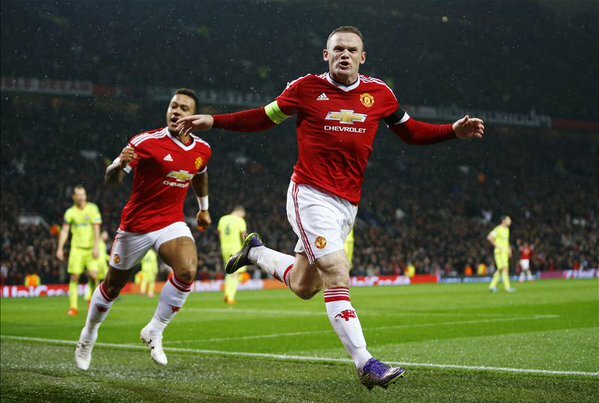 Wayne Rooney ended his goal drought and equaled Denis Law's all-time goal scoring record as Manchester United recorded their first win in four games against CSKA Mosvow at Old Trafford. Manchester United boss Louis van Gaal made the change many fans were desperately hoping for; Anthony Martial moved into his favoured position as the striker while Wayne Rooney, who started again despite his poor form, slotted back into the #10 role. Jesse Lingard and Juan Mata operated on the flanks, with Bastian Schweinsteiger and Michael Carrick holding the United backbone together. At the back, Ashley Young's ever-changing starting positions continued this time at RB, while Chris Smalling and Daley Blind were selected as the CB's with Marcos Rojo at LB. CSKA Moscow: Akinfeev; Fernandes, Ignasevich, Berezutski, Schennikov; Dzagoev, Wernbloom; Tosic, Natcho, Milanov; Musa. The Red Devils, playing in their vibrant home kit, surprisingly started brightly with much more direct play and forward runs. Wayne Rooney, especially, looked promising with his sharp movement in and out of the box. He EVEN got a shot away! Yes, you read that right. Wayne Rooney shot inside the box. United midfield duo Bastian Schweinsteiger and Michael Carrick were maneuvering the ball around well, using the width of the Old Trafford pitch to their advantage. Marcos Rojo was found bombing up the left flank on numerous occasions; whipping in dangerous crosses but the home side were unable to convert one and break their goal drought. Juan Mata, arguably, did have one of the best opportunities of the first half as he tracked a wonderful high ball from Daley Blind but was unable to make any solid contact with the ball to prod it past Akinfeev in goal for Moscow. Louis van Gaal's side started brightly, but CSKA Moscow's solid defensive shape and high amount of numbers behind the ball allowed them to disrupt United's early momentum and systematically took the sting out of the game. Leonid Viktorovich Slutsky's side sustained their negative nature in the first half, but were always ready to launch a counter-attack if the opportunity presented itself. Michael Carrick, making an unusual mistake, saw his square pass intercepted by Zoran Tosic who advanced up the pitch, but would be stopped in his tracks by a slide-tackle from Ashley Young. At half time, with a plethora of chances falling for United, they still somehow walked into the dressing room without a goal. CSKA Moscow, on the other hand, had executed their clear plan of holding a strong defensive line to keep out any United attacks in the first 45 minutes. Manchester United opened the second half with real intent; zipping the ball around the field with a plethora of forward runs, but despite that they failed to grab an important goal. CSKA Moscow introduced the dangerous forward Seydou Doumbia, and he was already causing the United defenders problems. After latching onto a clever dummy from Musa, Smalling made a crucial challenge on the edge of the area. The Russian side were probing, but just couldn't make De Gea work. After many chances fell and attempts were made but to no avail, Louis van Gaal resorted to Plan B and brought on Marouane Fellaini for Anthony Martial, which was greeted with an echo of boos. Long balls were hoofed forward to the Belgian, but no success was to be found. Meanwhile, Ashley Young continued his ridiculous attempts at trying to earn penalties with his unbelievably bad diving, and the referee shrugged off his and United's claims for a penalty. Louis van Gaal's men continued to pour the pressure on CSKA Moscow, and despite impressing many with their much sharper movement and intent going forward, the struggle to actually put the ball in the net continued. Somehow, after Jesse Lingard picked out Juan Mata in the box, who twisted and turned past his marker to feed Rooney a few yards from goal, the United captain got the ball stuck under his feet, tried shifting it onto his right but it slithered out of his possession. United's attacking had been the major problem in recent games, but absolutely brilliant defending from De Gea and Smalling prevented Doumbia from stealing all of the points. He scorches past two defenders, latches onto a through ball but his shot is parried by De Gea. Then, after the ball recycled to his feet, Smalling slid across the goal-line to deny Doumbia once mroe on his second shot from close range. Then, finally, after history, for all the wrong reasons, beckoned, Manchester United FINALLY scored! Jesse Lingard latched onto a long pass on the right side of the area, then side-footed into the middle for Wayne Rooney to meet with his head and guide the ball into the net. Old Trafford erupted, and rightly so! Wayne Rooney and Manchester United's goal-drought came to an end and Louis van Gaal's team picked up much-needed three points.